A talented Tornadoes offense proved too much for Columbia in a second round IHSA Class 4A football playoff game at Taylorville on Saturday, as the Eagles fell 45-23. Taylorville improved to 11-0 with the win. Columbia ended its season with a record of 8-3. The Eagles scored first in what was a competitive first half. After Columbia’s defense intercepted a pass by Taylorville quarterback Brandon Odom, Eagles running back Donavan Bieber ran it in from four yards out to put the Eagles up 7-0. Taylorville answered at the end of the first quarter, however, scoring on a third down and 10 play from 15 yards out. The point after attempt was missed, so Columbia held a 7-6 lead. With about eight minutes remaining in the first half, Taylorville scored on a 61-yard pass play to pull ahead 12-7. The Tornadoes padded their lead on a 16-yard QB scramble by Odom to make it 18-7. Columbia closed out the first half with some positive momentum, as receptions by Josh Marion and Sam Horner on passes from QB Nic Horner led to a 36-yard field goal by Sam Horner to make it an 18-10 game at halftime. The Eagles received the second half kickoff, but were unable to move the ball and punted. Taylorville drove it from their own 15 yard line to score on a 50-yard pass play to make it a 25-10 game. A Columbia facemask penalty aided the drive. 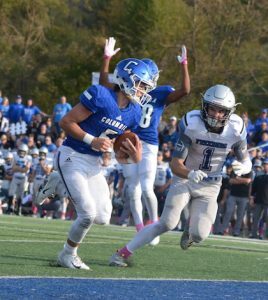 Columbia answered midway through the third quarter with a drive that resulted in an 18-yard TD pass from Nic Horner to twin brother Sam Horner, the sons of head coach Scott Horner. It was suddenly a close game again at 25-17. But it was all Taylorville from there. The next Tornadoes drive resulted in a TD, and the ensuing kickoff was fumbled by the Eagles at the 28 yard line. A Taylorville TD pass broke the game open at 38-17 late in the third quarter. A long Columbia drive early in the fourth quarter resulted in a fumble by Nic Horner that the Tornadoes recovered. A 79-yard TD pass play just a couple of plays later gave Taylorville an insurmountable 45-17 lead. Bieber scored on a 19-yard run late in the fourth quarter, but it was too little too late for the Eagles.